I love recipes. They are a source of inspiration — new ideas, new ingredients, new techniques. Sometimes the hardest thing about cooking is figuring out what to make, and having a good collection of recipes to turn to can eliminate the mind-wracking search for a lunch, brunch or dinner idea. As much as I admire creative recipes, though, I often cook on the fly, inventing as I go. Or fall into a rut. The rut is especially apparent when it comes to breakfast. I can find an interesting recipe or create my own at dinner, but breakfast usually finds me in a muddle. I'm not a morning person, and never have been. As a child, I could never bring myself to eat breakfast before leaving for school — it was just too early. Even, more recently, when I used to rise at 6 a.m. to get ready for work, it was only so I could leave the office earlier in the afternoon, not because I was at my best in the morning, or because I wanted time to make a good breakfast. Breakfast? Hardly. I'm all in favor of brunch recipes, but breakfast ideas are usually lost on me. If I can drink it from a mug or spread it on a cracker, it might get consumed. 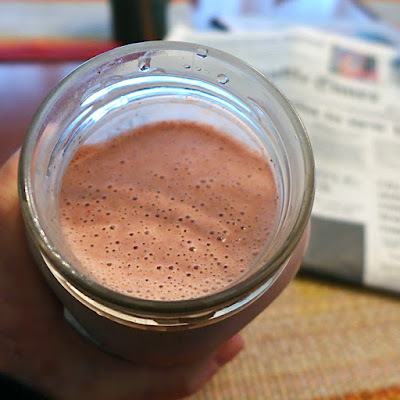 Most of the year, when it's relatively warm out (and in the house) smoothies are my breakfast of choice — throw stuff in the blender, pour it into a jar, and drink it. I have my set list of favorite add-ins, and vary the fruit a bit, but my smoothies don't change much from day to day. Not long ago, on a mild winter day, I came across a recipe for a healing banana split smoothie at Lexie's Kitchen and Living that sounded so delicious I was willing to break out of my breakfast rut to try it. I had it three days in a row, but then I began to miss all the foods I had been adding to my smoothies to make them healthier and more filling, and I decided to incorporate my old smoothie ingredients with the new ones, and fall into a new, delicious smoothie rut. To the banana split smoothie ingredients in the blender, I added one tablespoon of chia seeds, two tablespoons of hemp hearts, 1/3 cup of uncooked rolled oats and a handful of raisins. I didn't add the thick slice of organic lemon (with skin) that usually goes into my smoothies because I didn't think the flavor would go well with the peanut butter and cacao. And I used an unfrozen banana since the cherries I added were frozen. It tasted great and kept me full for hours. 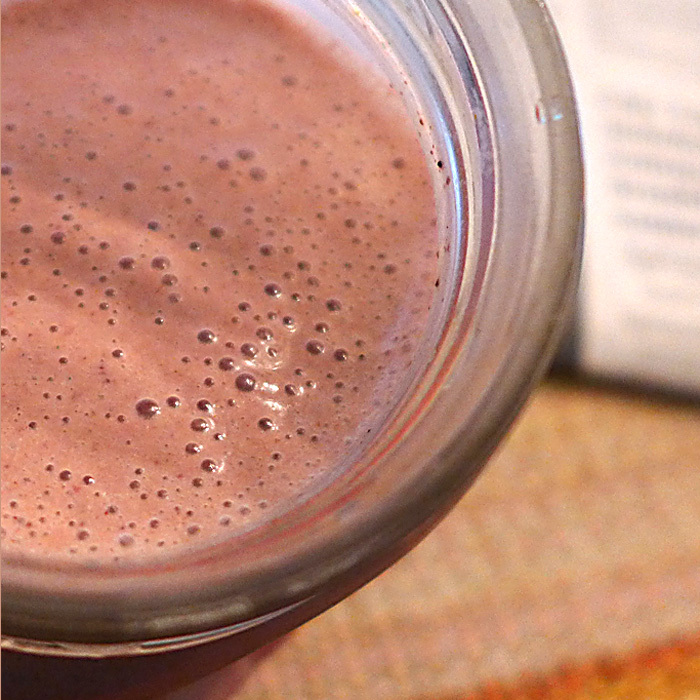 This is my new 'in-a-rut' smoothie, and I love it! Notes: When I make my usual breakfast smoothie, I use water or a combination of water and homemade soy yogurt for the liquid, though I've been using almond milk as called for in Lexie's recipe. And I use frozen organic fruit (from Costco) such as cherries, mango, blueberries, strawberries or cranberries, singly or in combination. If the smoothie is too thin, I add a few cubes of ice. My preferred brand of almond milk is 365 organic almond milk from the refrigerated case at Whole Foods because it seems to have the fewest noxious additives of the refrigerated almond milks. I should make my own, I know. Tortillas, tortillas, tortillas, Taco Cleanse, tortillas, pierogi quesadilla? TORTILLAS PART THREE: Not long after my tortilla craze took hold (read about it here if you missed it. ), I saw a post on Cadry's Kitchen about using tortillas to recreate a dish from The Chicago Diner — Pierogi Quesadilla. 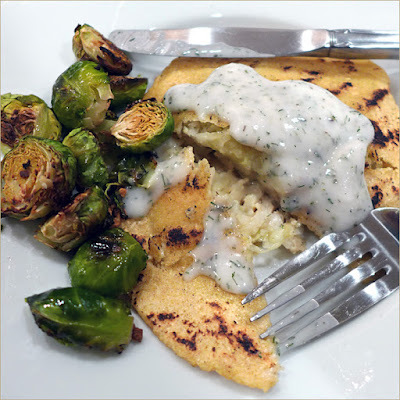 Once I understood that Cadry was using just the pierogi filling, (according to the Chicago Diner menu, it contains "sauerkraut, mashed potatoes, green onions, sautéed mushrooms & Daiya® Cheddar with vegan dill sour cream.") and not the noodles, to fill her quesadillas, I was eager to try it myself. Actually, I was eager to interest my husband in making it — I am the tortilla maker — and he was enthusiastic, though if you compare Cadry's photos to mine, you'll see that she is more artistic. 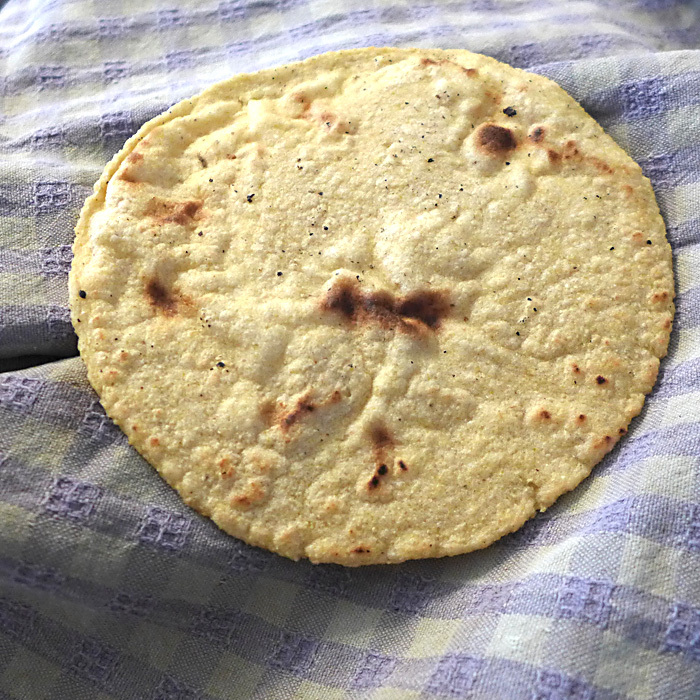 The tortilla in the photo above was one of my puffier ones so I was able to stuff the fillings inside it rather than stacking two together, or laying the filling on top and folding it over, both of which are more traditional quesadilla preparations. My husband's quesadilla was of the stacked variety. 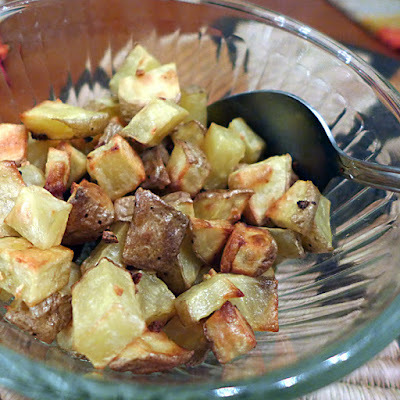 We also forgot to cut them into wedges, being eager to consume them as soon as possible. (Just a note: for our cheese we used one of Miyoko's Kitchen's hard cheeses, and though it didn't exactly melt, it tasted melted.) 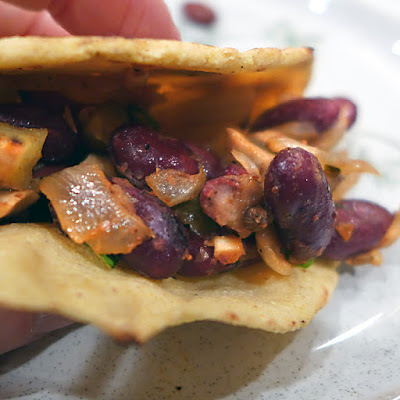 This was our first 'adventurous' tortilla experience — a far cry from the standard, but delicious, weekly taco dinners my husband used to make on his weekend cooking night, while our kids were growing up. The second serendipitous event to occur after my tortilla awakening, was the appearance of two of the authors of The Taco Cleanse, at a book talk/demo, in Seattle. 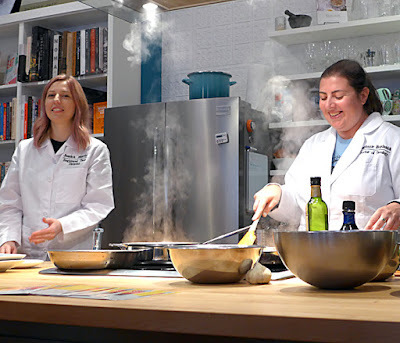 It took place not far from my house at The Book Larder, a bookstore dedicated to cookbooks. Jessica and Stephanie had us laughing out loud as they talked about their book and recipes. It was probably the most entertaining book talk I've been to in years. The whole time they spoke, they cooked — or rather, Stephanie cooked. Apparently, Jess' sole recipe contribution to the cookbook was tater tot tacos. Jessica is a master of the "I don't know how to cook taco," and I know there are many vegans out there who will be grateful to her for that. 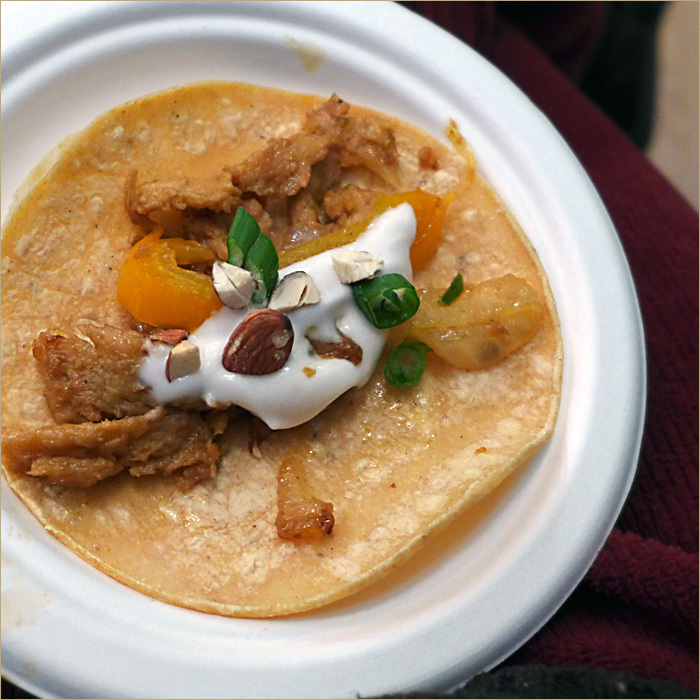 I now know that you can put anything into a tortilla — Pad Thai, curry, pizza — and call it a taco. Naturally, we purchased a copy of the The Taco Cleanse and have been eating tacos pretty steadily ever since. For our first plunge into The Taco Cleanse, I made fresh tortillas while my husband made his version of gallo pinto — Costa Rican rice and beans — except he used kidney beans and no rice. 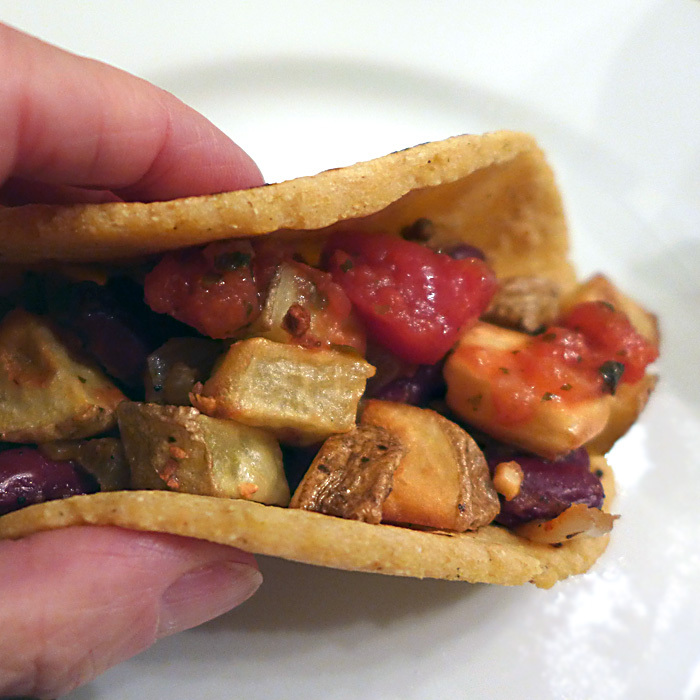 He also made abundant roasted potatoes so the tacos would be more fun. And a green vegetable, of course, on the side. Plus we still had dill sour cream leftover from the pierogi quesadillas, and a jar of salsa. Here's what our tacos looked like. 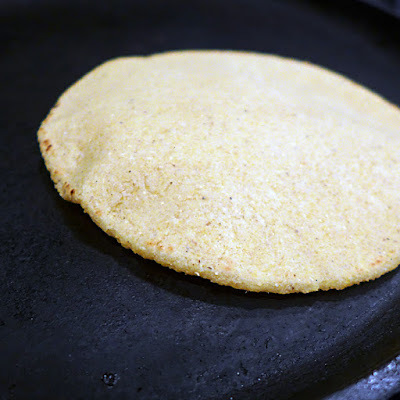 I still don't have a taco press but I'm wielding my cast iron frying pan like a real pro; just this morning I developed a new technique that flattens the tortilla just right. But as you can see, I've acquired a tortilla basket. I was in a Good Will store looking for, (cough cough), a tortilla press, among other things, and I spied a nice little basket sitting by itself on a shelf. I swear it was calling me. I had some reservations about employing a used basket to hold food but I followed directions for cleaning baskets, and disinfecting food contact surfaces with bleach and water. I scrubbed the basket, rinsed, then soaked it in bleach solution, and dried it in front of the fireplace. It looks and smells clean. I lined it with a thick napkin to keep the tortillas cozy while they wait for us to eat them, and it keeps the tortillas warm for at least an hour. 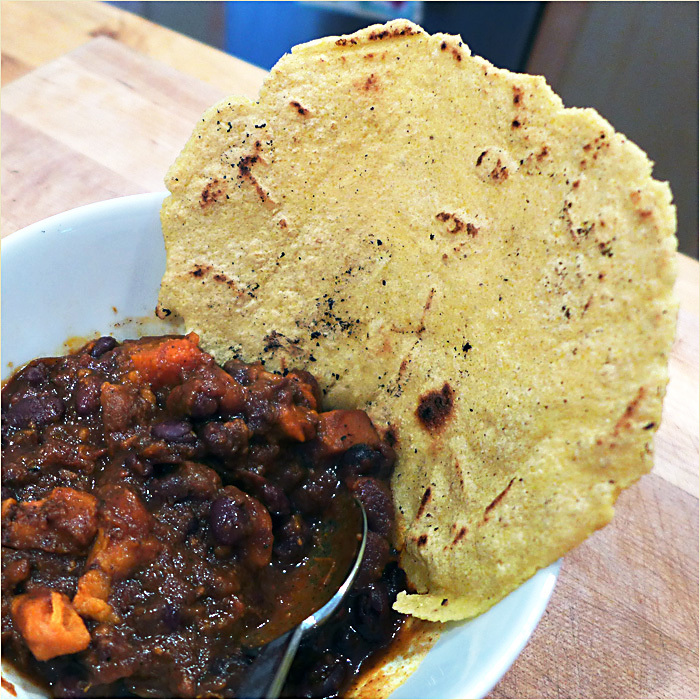 I made tortillas for breakfast, and ate leftover-bean tacos. After my husband finished his share of the tortillas, he asked, "What about dinner? 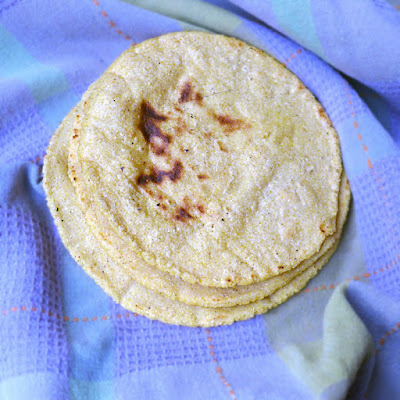 Are you making more tortillas for dinner/" It's clear to me that I have to up my production, and resort to reheating. It's come to this. 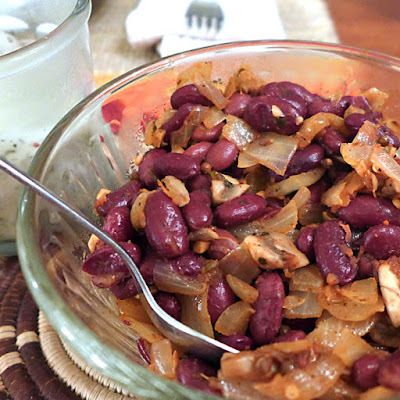 Black bean chili and sweet potato casserole from Fresh from the Vegan Slow Cooker. PART ONE: I was having a long video chat with my good friend Helene, and during the course of our conversation, she started telling me that she had been making homemade corn tortillas. I was surprised and impressed. 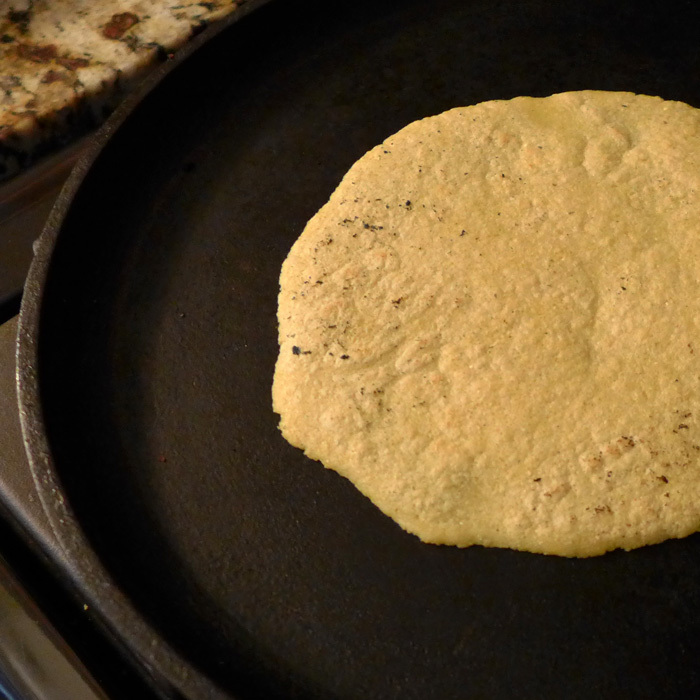 I have, and do, make a lot of things from scratch, but I had never made corn tortillas. I made wheat ones a long time ago, but never corn. 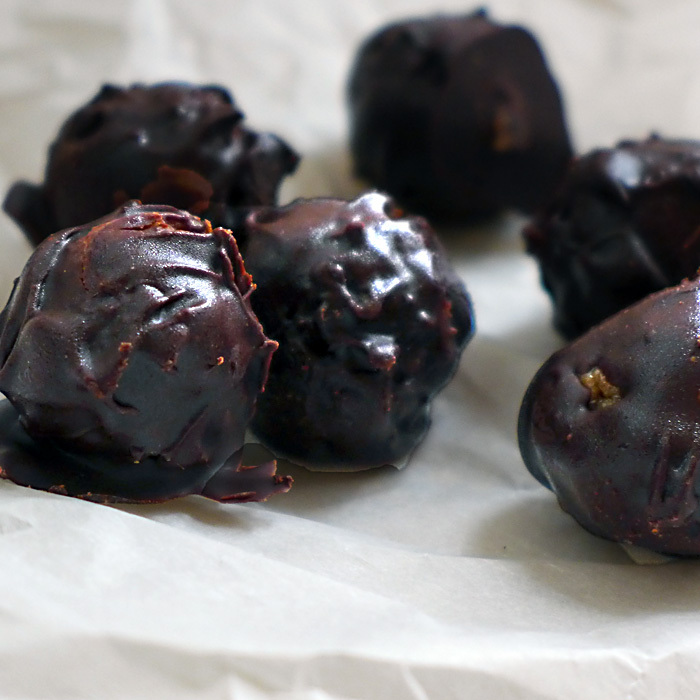 Never even considered it, but now that Helene was telling me how good the homemade ones were, I was all ears. Then she showed me her cast iron tortilla press and basket for keeping the tortillas warm, and my 'kitchen appliance' disease started to kick in. I could feel my body craving not only fresh tortillas, but a TORTILLA PRESS. How did I not know I needed one of those before now? Why, I even had a jar of masa harina in the cupboard. Give me strength. The bowl will be covered and the dough allowed to rest. I got hold of myself, as I looked around the kitchen for any spare space to store another gadget. I told myself I would have to make tortillas on a fairly regular basis using other means before I would allow myself to purchase a tortilla press, and I would have to give something away to make room for it on a shelf, should the need arise. In the meantime, I would use the bottom of a small cast iron frying pan to press any tortillas I made. I got out my (signed but rarely used) Rick Bayless Mexican Everyday cookbook, and studied up on tortilla making. I also looked the subject up in Terry Romaro's Vegan Eats World. By the time Helene sent me the video she had watched to learn the fine art of tortilla making, I was ready to go. Like any specialty cooking skill, making tortillas is easy and fast, it is an acquired art, and not one that can be mastered in one try. The ratio of masa harina to water has to be correct, as does the temperature of the griddle and the length of cooking time. But it's easier than you think, and the results that even a beginner can achieve are worth the effort. I watched the video three times. I was ready. Baking on the cast iron griddle. This is the video my friend sent me. I'm also sharing a link to Rick Bayless' directions for making tortillas. Following Rick's directions (sort of) for heating the griddle, I shifted my round pan so one side was closer to the flame than the other. Maybe that's why I saw a little puffing action. In any case, it looks like I may be making more tortillas, and if they improve, I'll let you know. 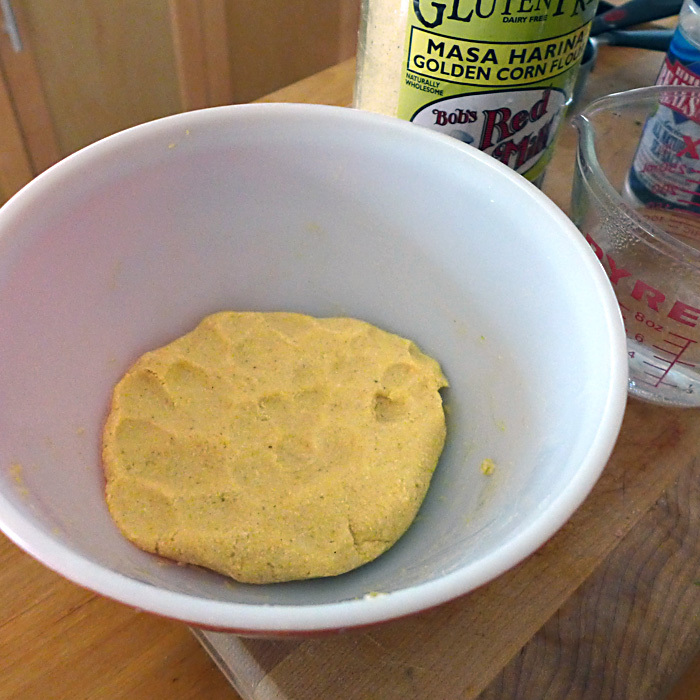 PART TWO: I made another batch of tortilla dough after re-watching the videos and re-reading the directions. I'm pretty sure I didn't use enough water the first time, and I pressed my tortillas too thin with my rolling pin. This time I added extra water, kneaded longer, and used only my frying pan to press the dough — not the rolling pin — so the tortillas were a bit thicker. I was aiming for 1/8-inch thick. 'Puffery', as my friend Helene calls it. Can you see the puffing up of my tortilla? Can you see it in spite of the terrible lighting? It wasn't a total puff, but it was close. I'm leery of telling just how excited I was to see the tortilla puff up lest you realize how boring my life is. Of course, if cooking success is important to you, you'll understand. This is pretty, isn't it? This time I cooked four tortillas and kept them wrapped in a towel and under the lid of my bamboo steamer, since I don't (yet) have a tortilla basket. 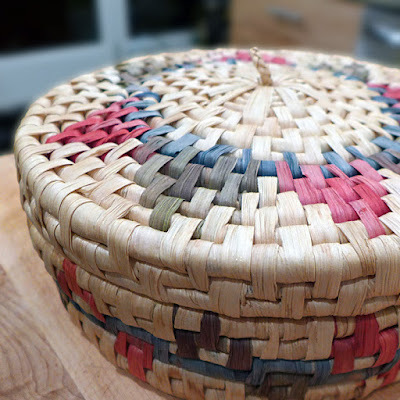 Actually, the lid over a plate on the counter makes a pretty good keep-warm basket, I keep telling myself. No need to get another basket, right? Rick Bayless says that the tortillas aren't fully cooked to perfection until they've spent a little time stacked in the basket, where they improve in taste and texture, and I believe him. He must be right, because this batch was even better than the first. Not only did the tortillas taste amazing, but they were flexible and had an air pocket. I think I will keep making corn tortillas. Now I just need a copy of The Taco Cleanse so I can put my tortillas to their best use! I really did make four, but it's hard to just look at them and not eat one. Do you make corn tortillas? Do you have a weakness for kitchen gadgets? Have you bought any kitchen equipment that at first seemed like excess but you now love? Any you wish you hadn't bought? 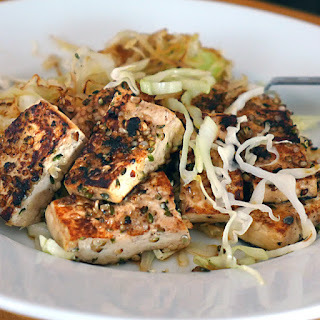 I was reading a book review for "Superfoods 24/7" on Cadry's Kitchen, and one of the recipes mentioned in the review was hemp-crusted tofu. I was immediately seized by a craving for hemp-crusted tofu. Perhaps not everyone would become obsessed with tofu coated in hemp seeds, but I just couldn't forget about it. 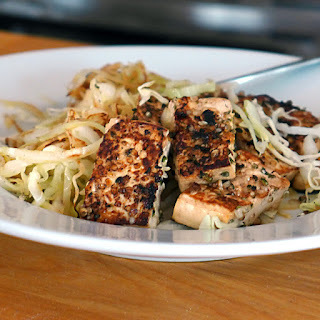 Cadry mentioned that the tofu was marinated in apple cider vinegar and tamari, and that was all I needed. I sliced some extra-firm, water-packed tofu and patted it dry with a towel. Had I more patience, I would have pressed the tofu, but I'm all about immediate gratification when I'm hungry and obsessed. I mixed a small amount of balsamic vinegar and tamari in a dish, dipped the tofu into it, then spread the tofu pieces on a cutting board. I sprinkled the pieces with hemp seeds and coated both sides. The seeds adhered easily. I heated my 8-inch cast iron griddle, added a little avocado oil, and set about browning the tofu. While the tofu was cooking, I thinly shredded a generous quantity of green cabbage, the lone green veggie left in the refrigerator. 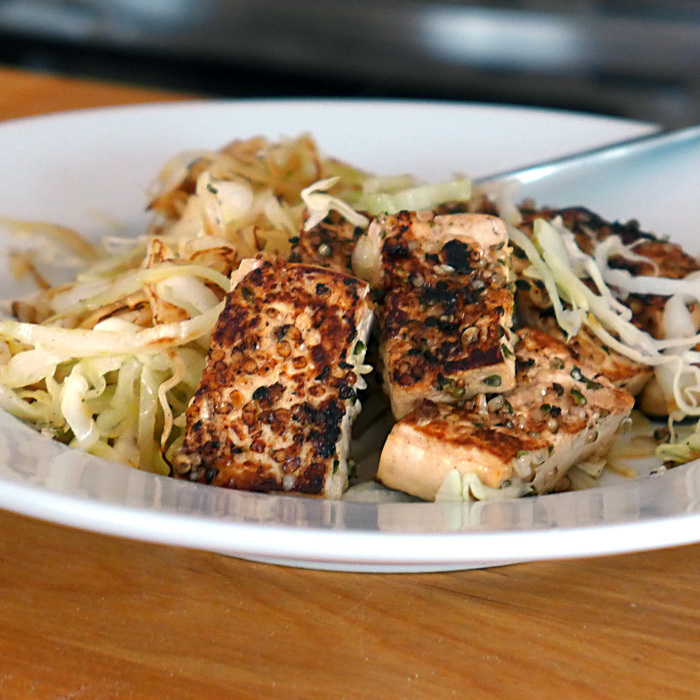 After the second side of the tofu was done, I placed it to the side and heaped the cabbage onto the griddle. I covered the pan with my wok lid and let it steam for a minute or two. 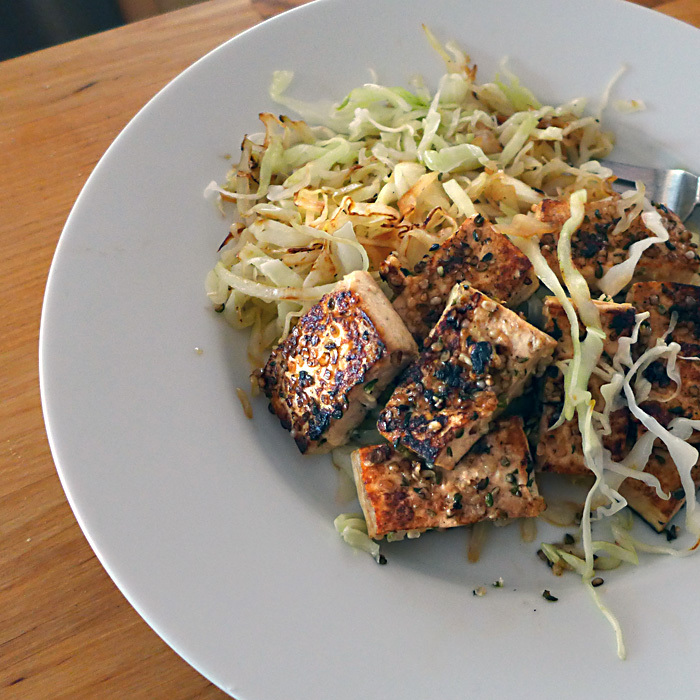 The bottom of the cabbage was browned and crispy and the rest was nicely wilted but still fresh-tasting. It was an excellent lunch. I wish I'd thought to grate a bit of fresh ginger into the cabbage and add some hot pepper flakes. Next time. As it turns out, I just learned I won a copy of Superfoods 24/7 on Olives for Dinner and am excited to be able to make the actual recipe for hemp-crusted tofu, as well as the other recipes in the book, soon! How do you use hemp seeds, if you do? Vegan cheeses seem to be multiplying like cat hairs on a couch — every time I go shopping there are new ones I haven't heard of. 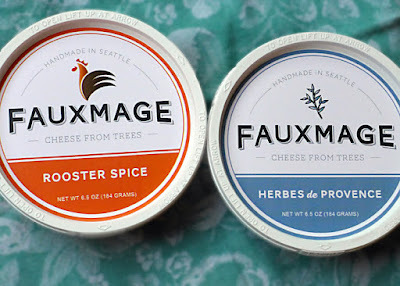 We were recently gifted with two flavors of Fauxmage, a brand new vegan cultured soft cheese being made right here in Seattle, by Brooke Young. Spreading the delicious cheese on crackers and munching away made me reflect on how much our access to vegan specialty foods has changed since I first became vegan in 1981. We had things like dried beans, grains, tofu, and a couple of cookbooks in case we wanted to make special items like "cheese sauce" or seitan. I had a copy of "The Farm Cookbook" with a recipe for a cheesy sauce I used for pizza, enchiladas or lasagna. I also had a recipe for tofu cream cheese, that I made on occasion. In 1998, "The Uncheese Cookbook" was published, and more recipes became available. Most of the time, though, we just enjoyed plant-based cooking that didn't try to replicate the animal foods we had left behind. I was never much of a processed-foods consumer, and since there were very few vegan fast foods accessible when I became vegan, I didn't get into the habit of using them regularly. Even now that so much is available, we don't depend much on packaged vegan foods, though we do sample them on occasion. However, I'm definitely happy to see all the current vegan foods at one's disposal to help new vegans and potential vegans transition to a plant-based diet. I know how hard it can be to let go of certain foods — especially cheese. Although it was more than 30 years ago, I vividly recollect my hallucination of pizza slices with extra, molten mozzarella, floating past my eyes at the moment I decided to stop consuming dairy. This is the truth, not a joke. 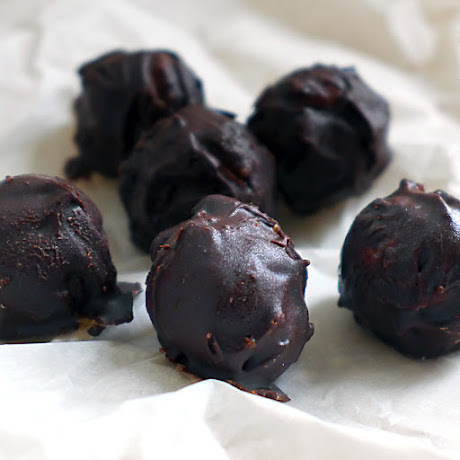 I know many vegans are fervently attached to one vegan cheese or another, but my husband and I have never been impressed enough in the past with any of them to make them more than a very occasional part of our diet. 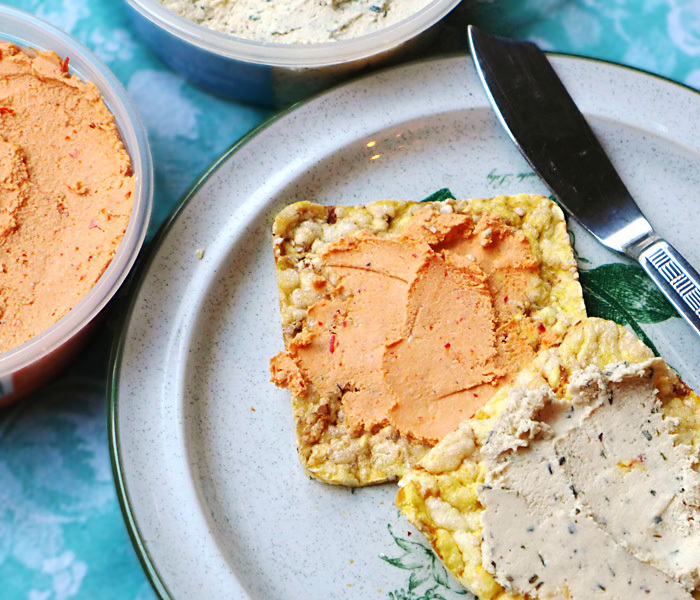 Many of the standard vegan cheeses are made from ingredients that, to me, don't seem worth eating, but now that the newest versions of cultured nut cheeses have appeared, we find ourselves splurging on one variety or another — usually Miyoko's Kitchen. (That is, if I don't make my own cashew cheese from one of Miyoko Schinner's recipes.) When Brooke offered sample containers of her new cheese, Fauxmage, we were curious, and happily agreed to try it. And we were impressed. It's amazing how some tastes and textures come flooding back no matter how long it's been since you've tasted them, and I think cheese is one of those items. "The future of food is here! All of our cheeses are 100% dairy free with real, live, active cultures and are healthier for people and the planet than traditional dairy products. 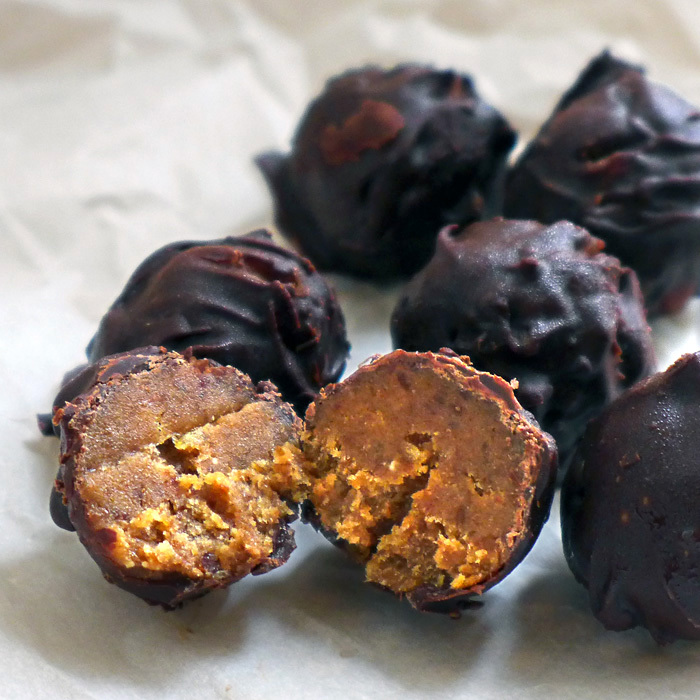 Our cheese is raw, vegan, Paleo, as well as gluten-free and cholesterol-free. We make our cheeses by hand, in small batches, to ensure the highest quality. We don’t use any oils, gums, starches or thickeners, so with Fauxmage you get all cheese and no fillers. We source our spices from World Spice Merchants in the heart of Pike Place Market and grind them fresh for each batch." We are enjoying both flavors, and I encourage you to give Fauxmage a try. 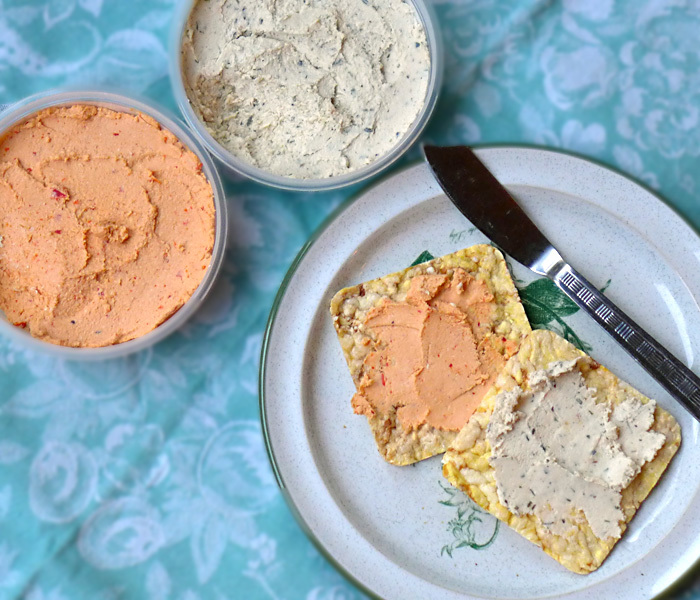 The cheeses are spreadable and delicious, with subtle flavors in a creamy base — delectible! Good ingredients and good taste! Do you have a favorite vegan cheese? (Ingredients, Herbes de Provence: cashews, herbes de provence, garlic, lemon juice, salt, cultures. 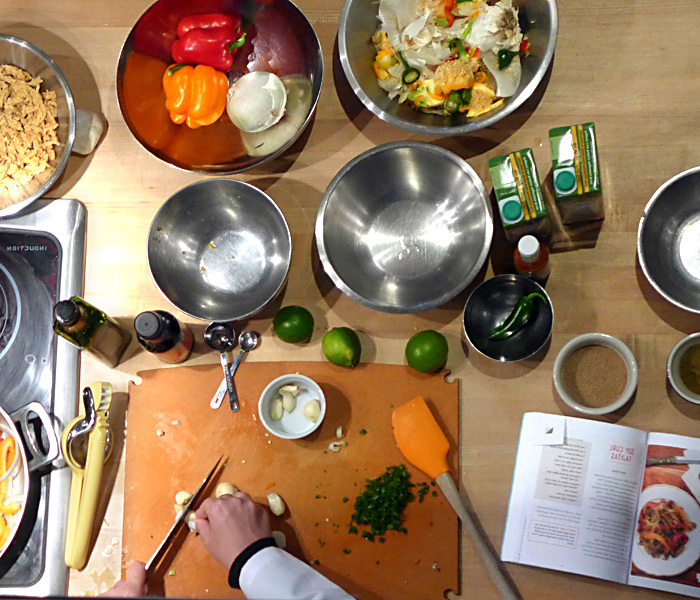 Ingredients, Rooster Spice: cashews, Mama Lil’s pickled peppers, spice blend, garlic, lemon juice, salt, cultures.) The Rooster Spice cheese has a spicy kick. 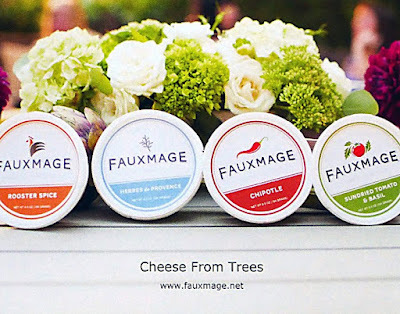 Hop over to the Fauxmage Web site to find out more about the cheese and where it can be purchased. One last little thought. I hate to be extra picky, but I have to point out the cheeses aren't organic, and there are a few ingredients that may be of concern if you worry about GMOs or pesticides. For example, the Rooster Spice contains Mama Lil's peppers in canola oil, which is possibly a GMO oil, and I don't usually buy peppers unless they're organic because they are such a heavily sprayed crop. I haven't asked Brooke about this yet so take my warning with a grain of salt. It may not be an issue, but I'm offering the information in case it is important to you. The canola oil in the peppers (that flavor the cheese) is certified non-gmo. Also, Brooke has switched to organic cashews but must use up her old labels for financial reasons. It's too expensive for a small company to print all-new labels.